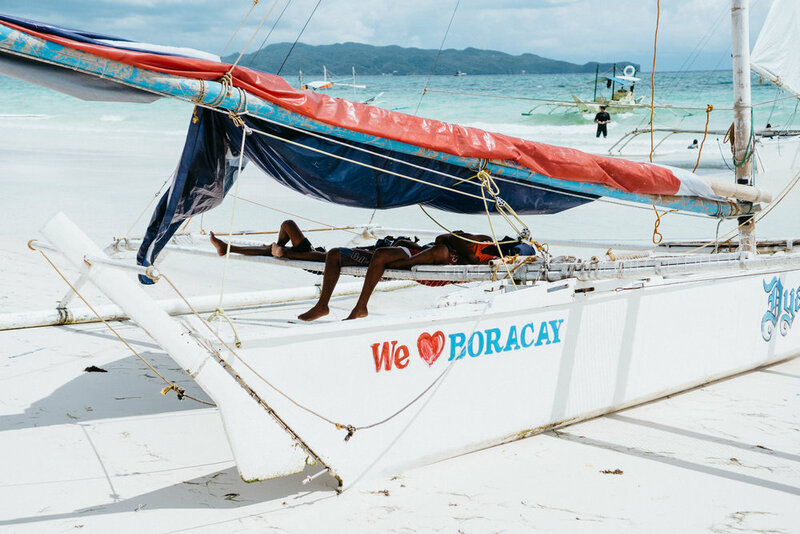 Before beginning our journey, I’d never heard the name ‘Boracay’? Who? Where?? I’d never seen this place, which in my mind given the nature of our trip could have only meant a few things - it’s tropical, it’s remote and it’s super quiet. Two out of three isn’t that bad. Let’s backtrack. 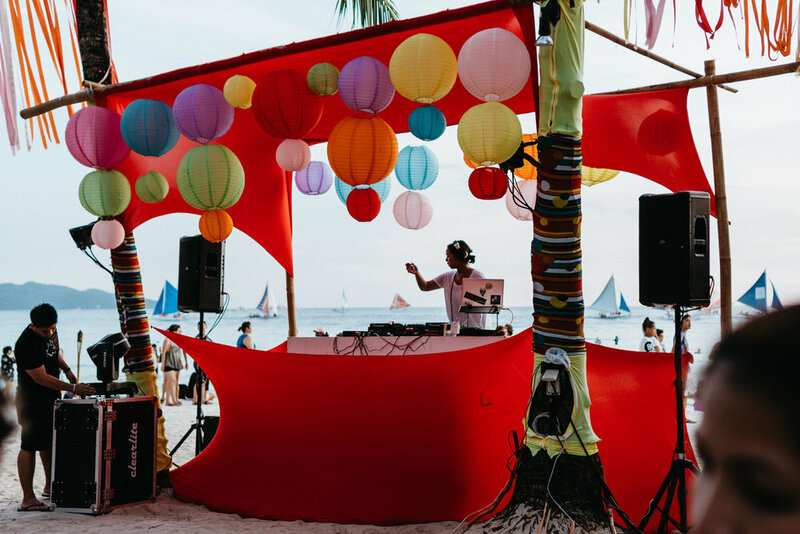 I wouldn't be telling you the truth if I told you that purely getting to Boracay wasn't one of the most intense experiences of my life, and possibly the most significant memory of my whole trip. After jumping onto a tiny plane at Manila airport, we aggressively landed 45 minutes later in what appeared to be a lonely field...not in Boracay. Following the rest of the seemingly confused cabin folk, we exited the plane onto the field where we found ourselves being escorted into minivans with not a suitcase in sight. After short and slow drive down a dirt road, weaving around stray dogs, bulls and motorbikes carrying small families on their handlebars we arrived at a small, rough looking building. It turns out that this was the airport/baggage claim. But where was Boracay? Now reunited with our baggage, waiting for us were some super small buggies. In we go, eight of us, suitcases on our laps. Pete and I being 6ft 4 cleverly invented ‘Tetris legs’ - locking our knees together to gain a few more inches of precious leg room, much to the jealousy of the equally tall American guy beside me who looked at us bewildered and said ‘this sure ain’t Texas, boys!”. Waiting at the end of the buggy ride was what looked like a small port with some tiny boats and a crowd of locals waiting patiently by the door. “Ferry Sir! Ticket Sir! Paraglide? ATV? Vroom Vroom!” What was happening? And there it was, Boracay, across the water. Amazing. Now we just need to there. “Yes, come! 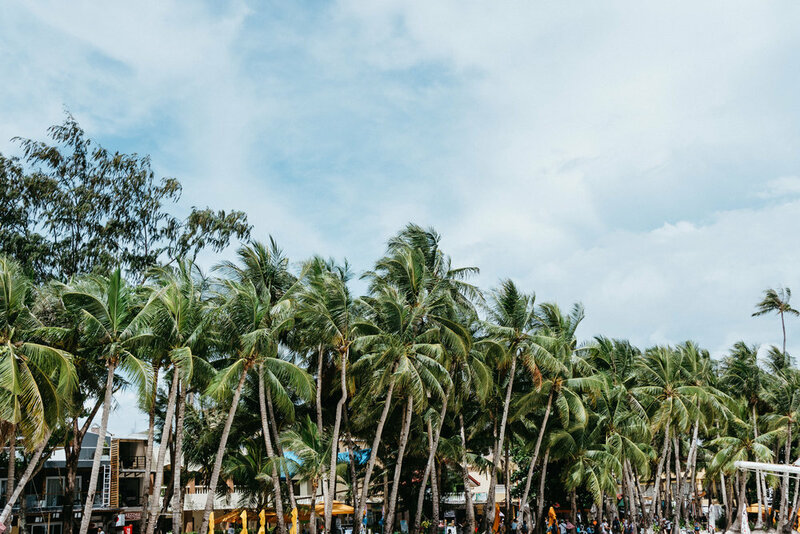 Here, yes!” Shouted a Filipino man, his face completely hidden by a straw hat, sunglasses and a black skull and crossbones balaclava covering his mouth and nose. A bold look. He then proceeded in dropping down a plank of old wood that was no wider than the length of my size 11 flip flop between us and his boat, which can only be described as a canoe with a lid. “Yes yes” he said, and waved Pete and I over. We had no choice, we were first up, we started a slow shuffle over the water, down the plank, 17kg suitcases held high above our heads. Finally reaching the boat, sweating with relief, we had to scramble up the side looking like spiders in a bathtub trying to balance our suitcases on the roof. 3,4..25,26,27...the boat was a magical bottomless pit and passengers just kept on piling in. The boat was so full that we all draped our life jackets across our bodies with a single arm, as the other was trapped and nowhere to be seen. 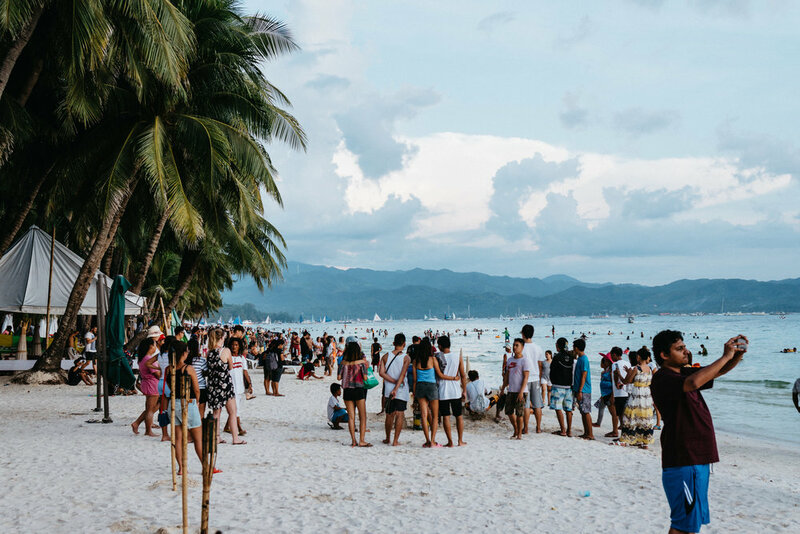 A short journey later, we’d arrived in Boracay…”Paraglide Sir? Diving? ATV? Vroom Vroom!” - you had to admire their determination. Oh look, another buggy, and its smaller, amazing, in y’get. Suitcases on the roof, Tetris legs, dirt roads, bulls, dogs, family motorbikes, donkeys, streets no wider than the buggy - I was in a cartoon...“Hotel sir, for you”. We’d made it. Having brushed ourselves off, unpacked and headed down a daunting alleyway constructed of corrugated sheet metal while dodging family motorbikes and dreaming of empty beaches and clear waters, we arrived at the beach... Two things instantly crossed my mind - “oh my God this is incredible” and “Jeez, i’ve seen less people in Heathrow.” We’d walked into what felt like an island wide party and it was amazing. 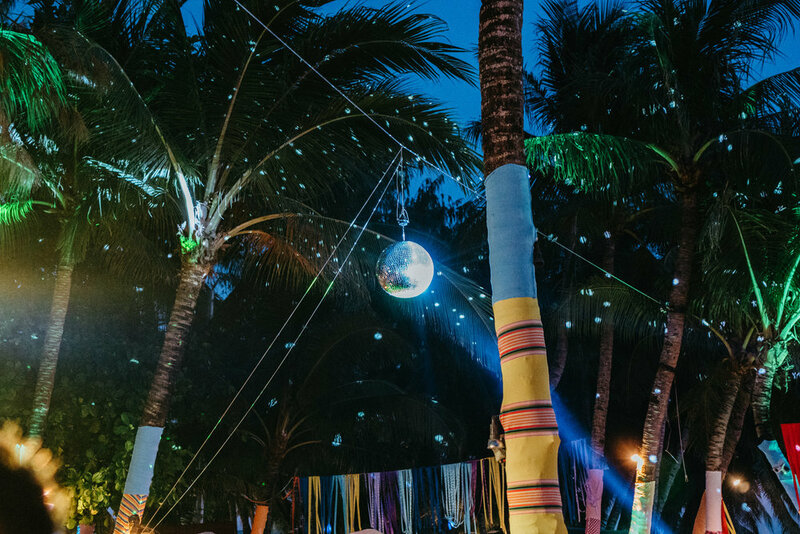 Boracay is the party animal’s ace up the sleeve and Google Image’s biggest lie.